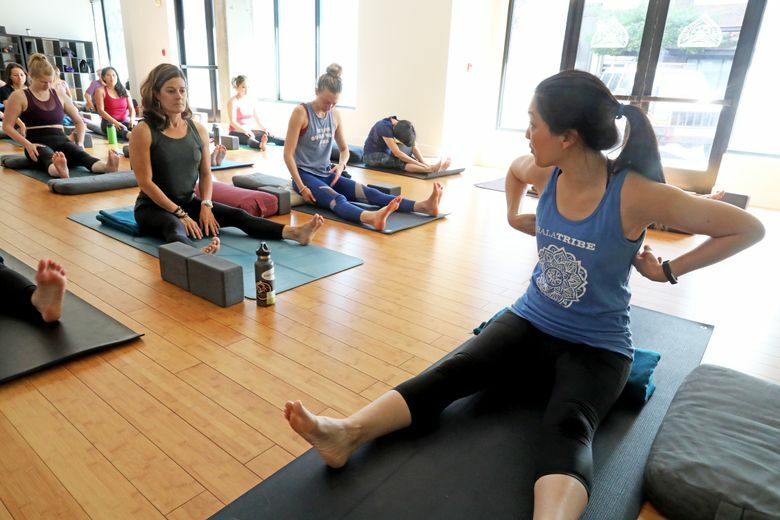 Bolsters, blocks, blankets — and breathing — help students get through a yin yoga class. I HAD NEVER been so excited to relax. I needed to unwind. A lot of the movement I love most taxes my body and nervous system (see: Olympic weightlifting). Like the rest of the world, I also deal with the stress of traffic, and spend a lot of time on electronics. I always feel better after doing something to lower my daily dose of intensity. But I don’t always make the time to go. 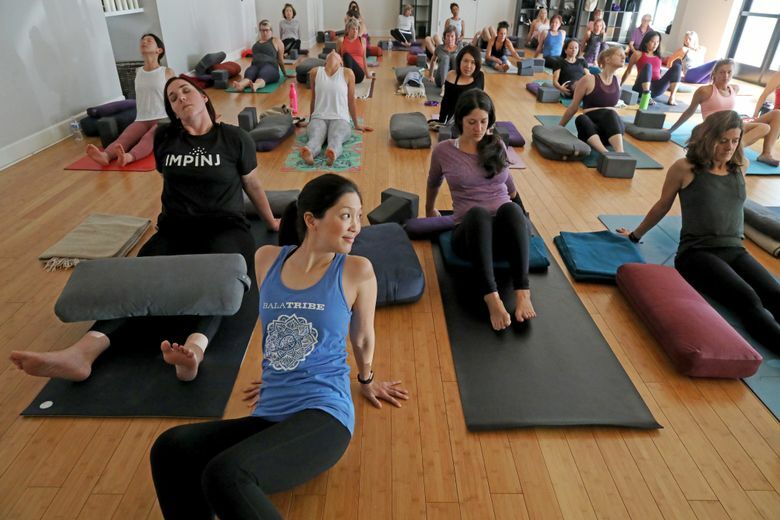 So when I picked out a Wednesday yin yoga class, I was thrilled. I attended yin yoga at Bala Yoga in Kirkland with teacher Pamela Chang. The class was full of other people of the same mindset as me. 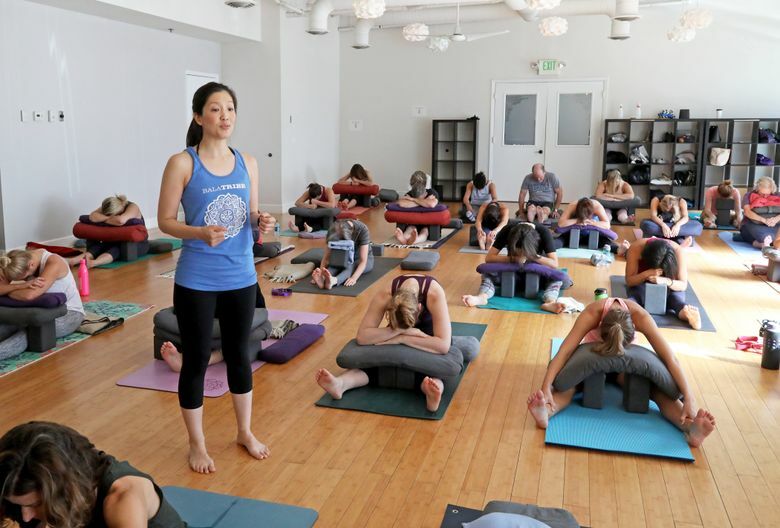 With yin yoga, you relax and stretch connective tissue through long holds. Chang had us grab props, including bolsters, blocks and blankets, to help us hold the poses. For the first pose, we set up with a bolster propped up on blocks, leaned back and brought the soles of our feet together. Once I was set up, I closed my eyes. My left hip flexor has been tight recently, and as soon as I lay back, I could feel the muscle resist the pose. I started to breathe, and listened to Chang explain that yin is supposed to be uncomfortable, but it is not supposed to hurt. This pose has bothered my hip in other yoga classes. But after a few minutes, I was surprised to feel my hip soften and release tension. It no longer ached. Magic! We moved into a forward fold. I sat up on my bolster, then placed a block in between my knees and lowered my forehead to my fists to support my head. Again, the goal was to relax fully. I could feel my midback start to stretch. For our third posture, we turned sideways, stretched our legs in a V and did another forward fold. My hips and inner thighs were more relaxed from the first pose, and I was able to give in. I felt my midback and shoulders get another smidgen of space. In between poses, Chang encouraged us to move around as needed. I rolled and did some twists, but I was content not to push any harder. The next pose was a supported fish, with blocks under our shoulder blades and the back of our head. This one felt freeing across my chest, and I loved getting a soft backbend. For our final pose, we did a half-saddle, folding one leg in and setting up against a bolster. I didn’t realize how tight my thigh muscles were until I got into this pose. I could feel my body tense at first, then I kept breathing and felt my quads let go of the tightness and tension. I also felt my ankle release. It felt good as in “good for me,” though I would not call it pleasant. I had to move slowly out of it to switch to the other side. Sometimes, it can feel counterintuitive to carve out time to relax. Going to a yin class was the best reminder that I need to do it more often. My body needs it. In all likelihood, so does yours. 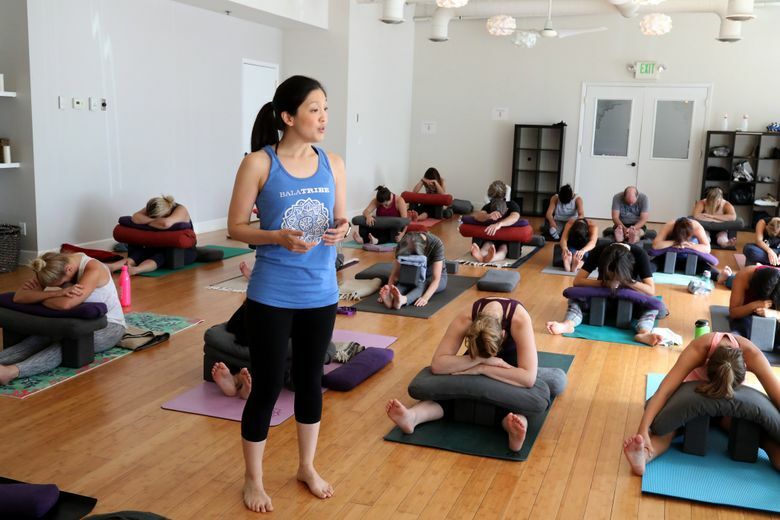 Nicole Tsong teaches yoga at studios around Seattle. Learn more or reach her at nicoletsong.com. Greg Gilbert is a Seattle Times staff photographer.